Where is the Rose Lady?? 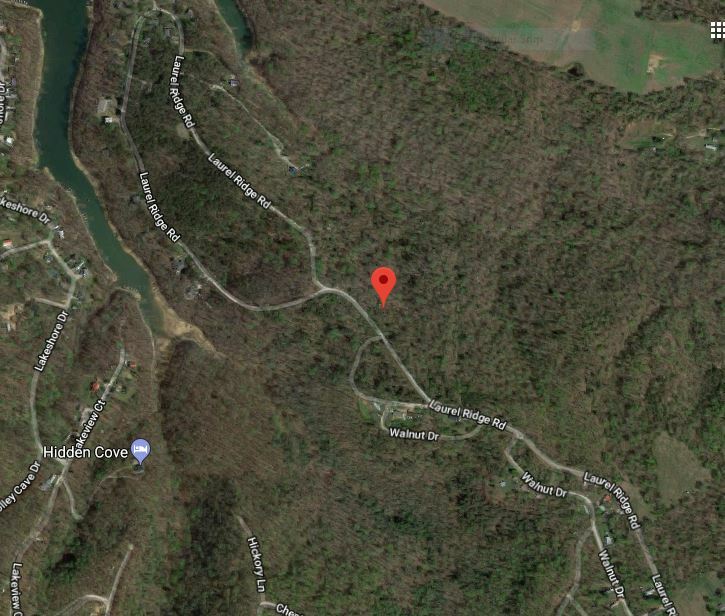 Ora Aylene J. Lawrence-Barrick was a widow who resided by herself in a small cabin off an isolated gravel road in Mammoth, Kentucky for 15 years prior to her disappearance. 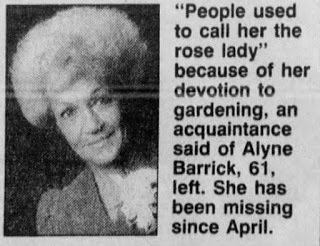 Aylene was last seen walking her dog on Laurel Ridge Rd on April the 12th 1996. She spoke to a neighbors son who was staying in his parents’ cabin at 2 pm. 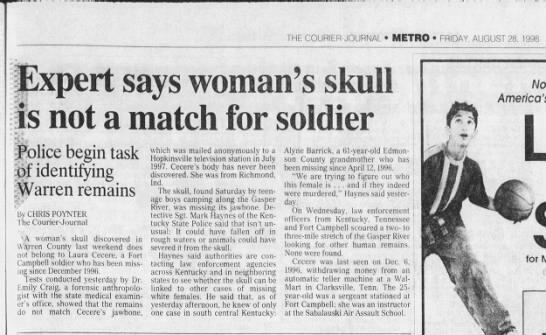 She was never heard from or seen again. sign of forced entry. LE forced their way in and discovered blood on the floor and a sofa was pushed out of place. In the bedroom, the bed sheet was fitted and there were bloodstained clothes on top of her bed. A glass that normally set beside her bed on a nightstand was on the floor. Her Purse along with her bed sheet were missing. Her dentures were soaking in their container inside the bathroom along with a burned out cigarette bud. A new plastic trash bag was placed over her trashcan before whatever happened occurred. It would appear as though her nightly routine was interrupted. A bag of trash sat atop the kitchen counter ready to be taken out the next morning. Her house keys were located in her truck. And her truck keys were located inside her house. 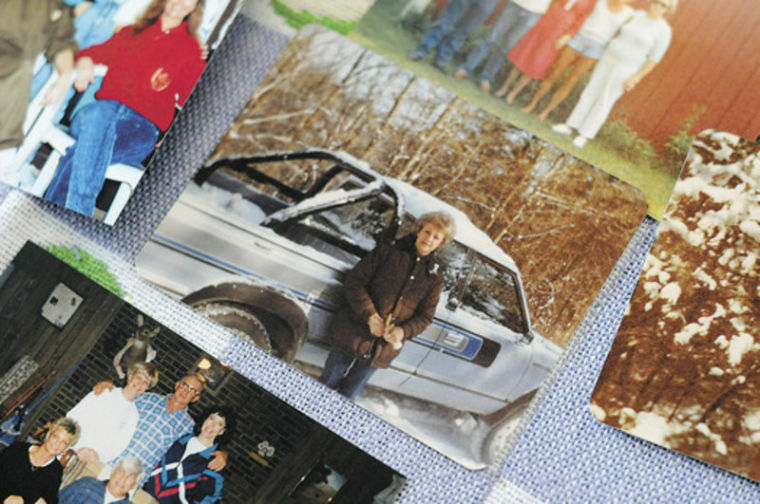 Barrick kept $400 in cash inside her freezer and it was there when the house was searched. A fake rock that she normally kept an extra house key in that sat outside her house was missing. But it’s uncertain if she always kept it there. Her Pomeranian Dog Fifi was locked inside its crate. She was reportedly dating a younger man at the time but none of her family knew him by name. Authorities believe that her body may have been wrapped in the missing bed sheet and buried in a shallow grave close to her home. Cadaver dogs were used in the beginning of the investigation without success. Police believe there may be people with information who aren’t coming forward. Alyne was known to have a quick temper and once threatened to hit a neighbor with a cane. Her family stated despite this she didn’t have any enemies tho. 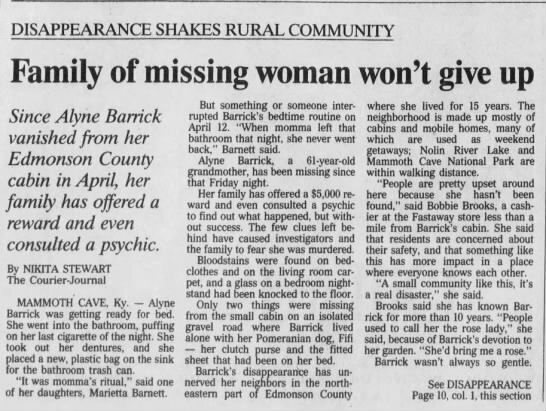 Barrick had employed a handyman at the time she disappeared. Little is known about him. LE did interview a man who was guilty of attacking an older woman in another state. But he wasn’t charged. Foul Play is suspected and the case is being treated as a homicide. I SUSPECT IT WAS SOMEONE IN THE IMMEDIATE VICINITY WHO WALKED OVER TO HER HOUSE THAT NIGHT AND INTERRUPTED HER ROUTINE. OR SOMEONE SHE KNEW INTIMATELY WAS THERE THAT NIGHT. I LEAN TOWARDS A LOCAL, LIKELY A NEIGHBOR WHO KNEW HER WELL ENOUGH AND WALKED OVER TO HER HOUSE AND GAINED ENTRY. EITHER BY AN UNLOCKED DOOR OR THE KEY SHE KEPT OUTSIDE INSIDE THE FAKE ROCK. I’D LIKE TO KNOW THE NAME OF THE BOY WHO WAS STAYING THE NIGHT IN HIS PARENTS CABIN WHO SHE TALKED TO EARLIER THAT DAY. AS WELL AS THE HANDYMAN. I’D LIKE TO KNOW IF LE EVER FOUND OUT WHO HER YOUNGER BOYFRIEND WAS AS WELL. I CONCUR WITH LE THAT SHE IS LIKELY BURIED SOMEWHERE CLOSE. I DID CONTACT LE AHEAD OF TIME ON THIS. THE OFFICER ORIGINALLY IN CHARGE OF THIS CASE FORWARDED THE INFO TO THE OFFICER NOW IN CHARGE. I NEVER HEARD BACK. I ALSO REACHED OUT TO ALYNE’S FAMILY AHEAD OF TIME. NEVER HEARD BACK EITHER. You can read the UPDATE on this case HERE.